Israel,18-month-old baby boy has died after his own mother ‘accidentally’ gave him kerosene to drink as water in Benin City. The incident took place at Iguma Street, Off Orewere Street, Off Medical Stores Road, Benin City, about 10am, last Tuesday. It was leant that the victim, Isreal Buhari had complained to his mother, a hired kerosene seller, that he was thirsty when the woman ‘inadventedly’ gave him kerosene stored in a beverage can, to drink. remaining content in his mouth before his mother realized the unforgettable ‘mistake’. Few minutes after ingesting the substance, the little child’s eyes were said to have turned pure white as he screamed uncontrollably. 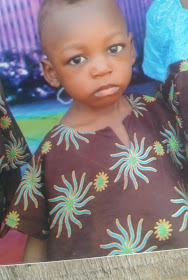 His mother Mrs Ata Buhari, said with the help of neighbors some volume of palm oil was immediately given to the baby before he was rushed to a hospital in the area where he died few hours later. Narrating how she ‘mistakenly’ served her only son kerosene instead of water ,Mrs Ata Buhari, from Kogi State stated that one of her children had filled an empty can of beverage with water which they took to store that fateful morning. She added that a similar container of beverage which she stored kerosene was kept in her shop as when her child complained of thirstiness she ‘mistakenly’ picked the one filled with kerosene. Father of the child Mr Buhari Hassan, 36, also from Kogi State, a bricklayer, said he was called to the hospital where he met the corpse of his only son. He appealed to the State Government and kindhearted individuals to empower him and his wife as his family is living from hand to mouth. 0 Response to "Woman Accidentally Kills Son After Giving Him Kerosene Instead Of Water (photo)"